Hamburger Hafen und Logistik AG and its partners have begun research and development work on the publicly funded FRESH project at the company’s Container Terminal Altenwerder (CTA). The goal is to integrate the battery capacities of the automated guided container transport vehicles that are in use at CTA into the German energy network as flexible storage units that contribute to the grid stability of the power supply. One of the greatest challenges of the energy transition in Germany is the safeguarding of grid stability. Currently, the share of renewable energy sources in the German electricity mix is over 40 percent . This development requires technical solutions by network providers ensuring companies and private consumers may be supplied with electricity at all times. Now, for the first time, HHLA and Next Kraftwerke, one of the largest virtual power plant operators in Europe, are investigating the extent to which industrially used mobile battery capacities can be connected to the grid so that primary control reserves may be utilized to provide stability. 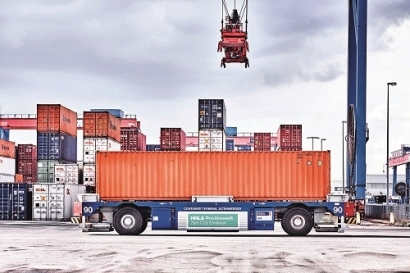 By 2022, the approximately 100 AGVs used for container transport at terminal Altenwerder will be completely converted to fast-charging lithium-ion batteries, potentially providing 4 MW for the energy market at the 18 electric charging stations. Together with Next Kraftwerke, the OFFIS Institute for Information Technology in Oldenburg and the University of Göttingen, HHLA is developing a process and software solution for accessing the power market. It will digitally control the demands of the virtual power plant operator and smooth terminal operations. FRESH is funded by the German Federal Ministry for Economic Affairs and Energy as part of the “IKT for Electromobility III” technology program and receives subsidies of approximately €1.4 million.